The rise of smartphones is just one example of globalization in the modern world. The iPhone is designed in California, built in China and exported to consumers across the globe. The rise of smartphones and the impact they are having on developing economies is just one example of globalization in the modern world. This was not always the case – 500 years ago, international trade was nearly non-existent. So how did international trade become the globalized affair it is today? A new set of charts from Our World in Data explains how this happened by illustrating the evolution of international trade over half a millennium. 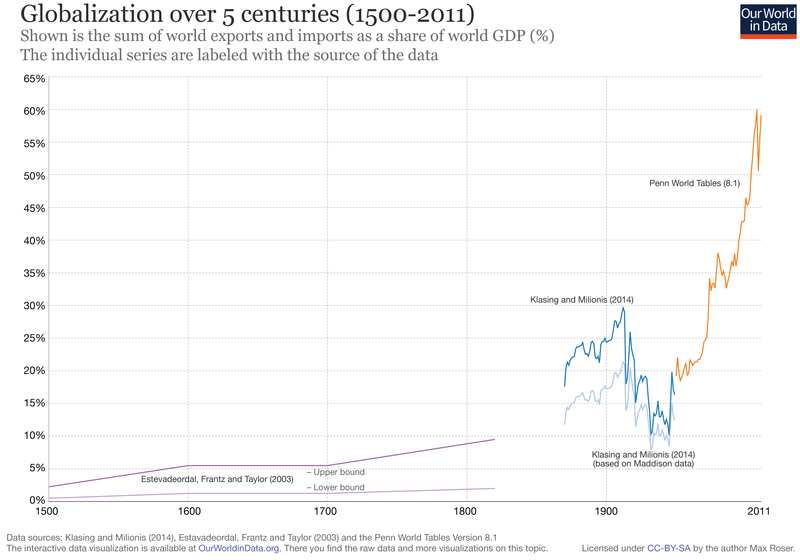 The chart below shows the flows of international trade over the past five centuries. Between the years 1500 and 1800, international trade was limited: the sum of exports and imports never exceeded 10% globally. Trade also grew slowly, and the average compound growth rate was less than 1% over this period. As the chart shows, European colonial powers dominated international trade. International trade began to increase in the 19th century. The First and Second Industrial Revolutions saw technological advances in communication and transport, as well as political and economic liberalization. This first wave of globalization saw the emergence of the international economy, as worldwide trade grew annually by more than 3%. Click here to view the full interactive chart. Growth in international trade faltered in 1914, at the start of the First World War, as nations began to adopt protectionist policies. This decline in international trade lasted until the end of the Second World War. After the end of the Second World War, international trade began to grow rapidly, as protectionism gave way to the still ongoing second wave of globalization. Since 1945, most countries have turned away from isolationism in favor of internationalism – and today international trade is now more important than ever. The data was originally collated and published by Our World in Data: Mohamed Nagdy and Max Roser (2016) – ‘International Trade’. Published online at OurWorldInData.org.